Banner-Advertisement (Display Ads) is one of the most popular means of online marketing next to text advertisements (Google AdWords etc.). Now, you can use the SISTRIX Toolbox to analyse the campaigns of your competitors and examine which websites they use them on, where they link to, and what formats they use. More than 1,000,000 banners have already been integrated since the start of this new function, when it was introduced on the 23rd October 2014. Since then, the crawler is continuously running for 24 hours a day to find new integrations and constantly increasing the database for this new feature. Simply enter a domain into the toolbox as usual. After that, you can – if any advertising materials were found – see the entry “Banner-Ads” in the Ads-Module Menu. A large amount of data is already available for many big and small websites. In this tutorial, I will use the domain „amazon.de“. 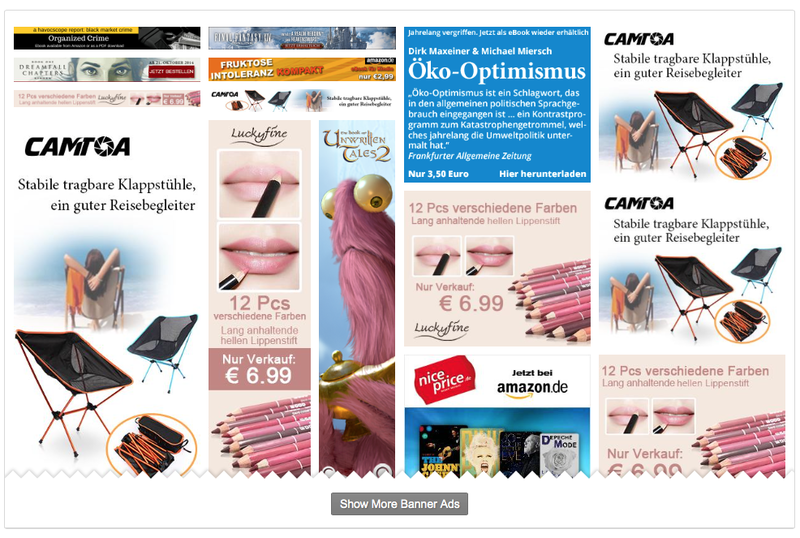 After entering the domain amazon.de into the search window of the toolbox, continue by clicking on the entry “Banner-Ads“ in the Ads-Module Menu. In the first step, you will see an overview that should be familiar from different parts of this software. So far, our crawler has found 402 different banners on 1,821 Domains. The four most popular banner formats also align with the results of different tests. By the way – the leading format of banners on mobile versions of websites is 320 x 50 pixels. On many websites that work in Affiliate Marketing, the 468 x 60 pixels format is still one of the most popular formats. The reason for that though, is often found in the very limited choice of formats from which partners may choose. In the fourth box of the overview, you will find the most popular target domains. For analysing your competitors, it is useful to know which advertisement link to each page. As you can track up to five domains at a time to your weekly monitoring, this new feature in the toolbox also allows you to obtain a useful report of advertising materials (formats, contents, target domains, sources). The menu entry “Banner Ads” gives a first look at any found means of advertising. To view all banners simply click on the button „Show more banners“. After that, all found banners will be displayed. One of the advantages of this overview: Once the season changes, you can quickly take a look at how the new banners of your competitors look like and what advertising materials are used most often. Of course, you can also see the most popular link targets here too. The overview shows the most recently found integrations – which means all the websites on which our crawler last found advertising materials that point to the target domain „amazon.de”. Additionally, you will always get to know the source, formats and targets. You will see if retargeting is active (if the checkmark has a dark-grey color) and the time we found the integration. If you want to see more integrations and filter the data, simply click on “show all banners” at the end of the table; there you will find a table with all integrations. Here we truly show all integrations. In the case of Amazon, it would be the same 2,256 records. Without a filter, this would be a lot of work. Do you only want to see advertising materials that use retargeting? If so, use the following combination of filters. 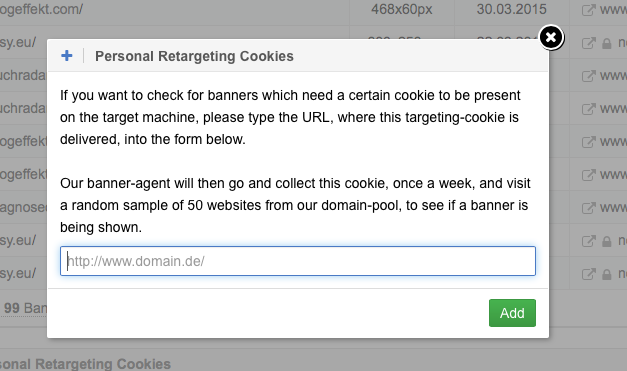 You can also specifically tell our crawler from where it should obtain a retargeting cookie. Just scroll to the end of the page “Banner-Ads” and click on “Add” next to “Personal Retargeting Cookies”. Now enter the desired URL into the window that just appeared. You’re active in Affiliate Marketing and operate or oversee a partner program; regularly analysing your competitors is very important to you. To keep up to date when new partners become active with your competitors, you put your competition’s domain on the retargeting list. There, you can put up to five Domains for the Ads-Module. The data will be updated weekly, and you will be able to see which websites become active as partners with your new competitor. Of course, this also works if you are an Affiliate. After all, you just have to enter the target domain of your lucrative partner programs and can always see when other affiliate-pages integrate banners.